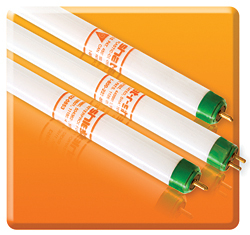 The safety-coated, 49-watt T5HO lamps feature a low 1.4 milligrams of mercury. Benefits of the lamps include higher color rendering, improved lumen ratings and a range of color temperatures. The units also save on maintenance and recycling costs by extending the relamping cycle.